I'm very pleased to announce my first commercial video game release! 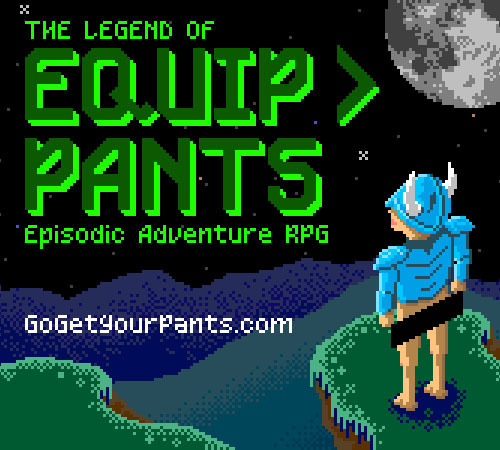 The Legend of Equip > Pants is a pantsventure RPG taking place in an alternate universe where an old man in a cave would hand Link some wooden underwear instead of a sword (if there were old men living in caves). The game unveils itself as a series of brief episodes, because who has the energy to stay invested in 40 hour long RPG plots anymore? I sure don't. Please try it out! Episodes 1 and 2 are now playing. I had the joy and privilege of working on the Beemo - Adventure Time iOS app. I'm a huge fan of the cartoon, so this was a special project for me. The app was produced by Cartoon Network and designed by Ham in the Fridge. My company Zachstronaut LLC was hired by Ham in the Fridge to program the app for iPhone, iPad, and iPod touch. My project Firebomb is a Firefox plugin, a browser bookmarklet, and an iOS App. Firebomb lets you pretend to blow stuff up with 8-bit explosions. I'm sure you are probably familiar with Firebug, the ubiquitous debugging plugin for Firefox. "If you can't fix a bug with Firebug, blow it up with Firebomb!" Firebomb started out as a tongue-in-cheek parody of Firebug that I originally did for the 10K Apart Contest in 2010. Quality stress relief! Firebomb has since evolved from the original gag and developed a life of its own. Firebomb for Firefox and the Firebomb Lite bookmarklet are both free and available for download today! Use them whenever you need more firepower than Firebug alone! I made Firebomb AR for iOS because I also wanted to bring the fun of 8-bit explosions (including gratuitous chippy kaboom sound effects) to the world outside of web browsers. Just like The Kids in the Hall used to pretend to crush heads between their fingers, you can launch the Firebomb AR App, aim your camera at a target, and pretend to blow it up by tapping the screen. Buy Firebomb AR for yourself, or as a fun gift for the special geeks and kids in your life. (Big, grown-up kids, too!) Your purchase will support an independent App farmer who uses 100% organic 1s and 0s, and it will greatly encourage his odd sense of humor. The most popular and powerful web demolition tool, Firebomb puts an arsenal of fun, stress relieving 8-bit explosives at your fingertips. Available as a plugin for Firefox and as a bookmarklet for other browsers, for when you need more firepower than Firebug alone. And, Firebomb AR is an augmented reality app for your iOS device. Get Firebomb today! My Watermelon Sauce partner Paul and I were talking about journaling while working on projects. We prototyped and then built a Mac app that we think makes it easier to write little notes to yourself about what you are doing during coding sessions. It can be really nice to keep a programming log. Especially at the task level. I like to have notes about how long things take and what bugs/challenges I encounter along the way. In fact, that's part of the reason why I created ShortJournal (although I've come to use SJ much more as a bucket for code snippets, ideas, and bookmarks). I think the biggest hurdle I trip on when I get lazy about detailed journaling while coding is the distraction factor. I don't want to have to switch windows to do it, or even worse, take my hands off the keyboard and mouse to pick up pen and paper. I was chatting with Paul about this problem and about how it might be kind of nice to have something pop up every 30 minutes and ask me what I'm doing, and then just log it with a timestamp to a file. Super simple. He was instantly interested. Within about 15 minutes I'd figured out how to make a prototype in Apple's Automator tool. It was simple enough to pop up a single line text input prompt with the question "Whatchya dooooin?" and then log the answer to a time stamped file. I saved the workflow as an App, and hooked it up to a crontab, and started using it. I really liked it, and Paul liked the prototype, too. # Save and quit the editor, and that's it! Like I said, Paul liked the idea. He suggested it become an open source Watermelon Sauce project, and that sounded like a great idea. Within just three hours of work he'd built the Native Mac App in Xcode and put WhatYaDoin on GitHub. Check it out! It currently lives in the toolbar and handles popping up every 30 minutes itself. We've both been using it today, and it is very interesting! Next big question is going to be what to do with all the little journal snippets! I think it could be very useful for blogging or doing estimates.